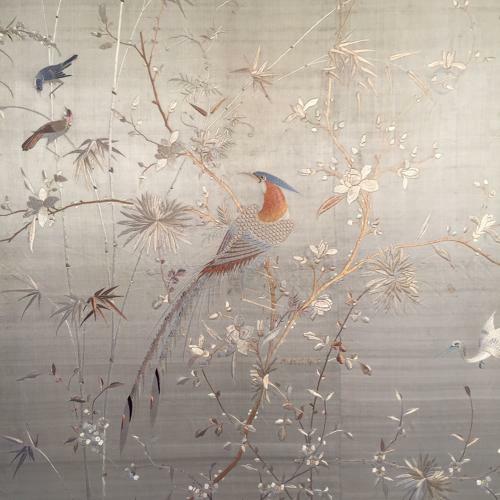 A beautifully hand embroidered silk depecting pheasants, birds and butterflies in amongst roses, bamboo and chrysanthemums. The craft of the stitching is particularly incredible with expert kneedlepoint realistically detailing feathers and birds or butterflies in motion. A wonderfully executed large scale piece with gorgeous soft earthy colours. Chinese made for the European market c1920. Sadly one or two very small areas of a mark/stain as shown in the images but otherwise in good overall condition. Would look stunning hung as a feature wall.